Championed by Martin Scorsese, who has helped finance a restored print by the UCLA Film Archives, Raoul Walsh's Pursued (1947) is a riveting pyschological western, brilliantly shot in black-and-white by the masterly cinematographer, James Wong Howe, and featuring one of the first great roles of sullen-faced Robert Mitchum. He's an adopted child of rancher Judith Anderson, who rescued him from some horrible early-childhood incident which he can't quite recall but which causes him headaches. Migraines and primal scenes, and the realm of "recovered memory" in a cowboy flick? 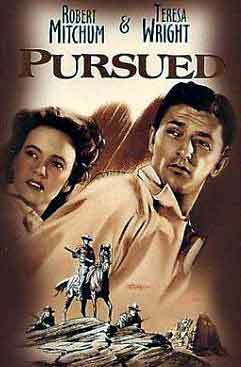 No wonder Pursued has been called the first "noir" western for its Freudian undertones, for Mitchum's doomed, fall-guy tendencies as an adult, by which his good intentions can't stop him from killing people, for warped Teresa Wright marrying him out of hate, so she can revenge his offing her devious brother. Forget Zane Grey or Luke Short: screenwriter Niven Busch owes much good here to Oedipus Rex and Wuthering Heights. Filmmaker Raoul Walsh, also a Scorsese favorite for The Roaring Twenties, High Sierra, and Colorado Territory, shows off his talents in spades; he's certainly the finest American filmmaker who has never been honored by either a critical study or a retrospective.